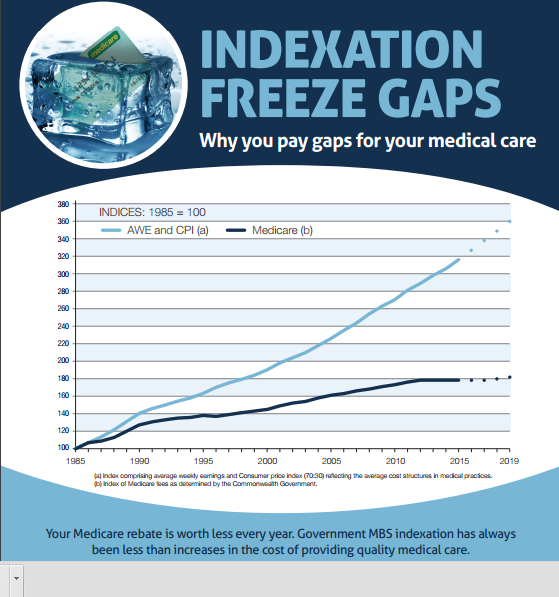 In 2014 the Government put a freeze on indexation of Medicare rebates for four years from 1 July 2014 until July 2018. In the Federal Budget this week they announced extending this freeze until 2020. Freezing Medicare rebates for four years is simply winding back the Government’s contribution to patients’ health care costs. In practice it means that the $37.05 rebate you currently receive for a standard consultation will not increase at all until 2020. The relative value of this and any other medical rebates will decline significantly over time, as businesses providing medical care will likely increase fees in line with the increased costs of running a business. The chart below shows you how little Medicare rebates have grown in the past 30 years compared to other economic indices such as the CPI. Rebates are frozen across the whole sector, and will include GP, Specialist service, medical procedures and also pathology and imaging (the rebates for those services have not increased in 15 years). The proposed funding for hospitals will prop up existing services, which we know in some areas of medicine are quite patchy (eg. non-existent public outpatients clinic in many specialities). What it all adds up to is less money being given back to you to cover your medical costs. It also reduces the capacity of small businesses such as Erskineville Doctors to bulk-bill our less well-off patients. We aim to be a practice that is for everyone in our local community, and we pride ourselves in already being what the government is now calling a “healthcare home” for all of our patients and their families, not just those with chronic and complex health needs. 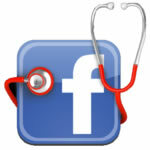 We don’t want to reduce the quality of your care by rushing you through appointments. We will be writing to the major parties about these budget proposals now and in the lead up to the Federal Election. We urge you to take the time to read the detail of these proposals and make up your own minds, and write your own letters as you see fit.